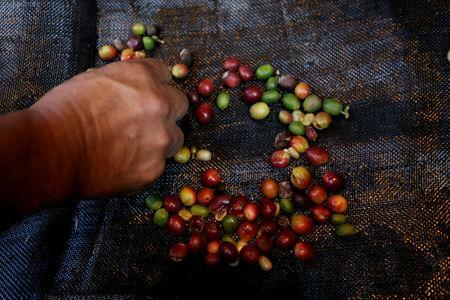 BOGOTA/NEW YORK (Reuters) - A proposal by Colombian coffee growers' federation that producer countries sell their high-quality harvests untethered from the New York market price could encourage buyers to look for alternative providers, importers and exporters said. But despite the proposal's popularity with struggling growers, an alternative price could have buyers looking elsewhere. "There was a time a while ago, when Colombia was so far above everyone else, quality-wise," said Shawn Hackett, president of Hackett Financial Advisors, a Florida-based futures brokerage and research firm specializing in agricultural commodities. "Nowadays, there's some really good quality in Brazil, really good quality in Central America, in Africa." Colombia's federation has long made the case to large buyers that it is in their interest to ensure producers earn a profit. "If the spread between the market and the prices that the Colombian exporters are trying to charge gets big enough, you will probably see a lot of people switch over to other origins," said a U.S. importer. "People will become less dependent upon Colombian coffee." "I don't think the proposal is realistic," said Giancarlo Ghiretti, of specialty exporter Caravela Coffee. "Selling large amounts of coffee outside of the market is difficult and risky. Large buyers will look to replace Colombia with other origins." The U.S. National Coffee Association said its members, who include major chains Starbucks and Peet's Coffee & Tea, agree growth requires stability for farmers, but price controls are generally unsuccessful. "While the pressure to find quick economic fixes is understandable due to current market dynamics, history shows that policies designed to control price ultimately hurt those they are meant to protect," the industry group's president Bill Murray said in an email.